It was 2006. RIM/Blackberry just settled a patent infringement case for $612.5 million. US patent law had been largely stable for decades. The Chinese government was not all in on IP. The US government ran the world's best patent system, and "Designed in California, Manufactured in China" was the tagline on almost every Apple device. The RIM settlement was the canary in the coal mine: Infringers did not like the idea of having to pay this kind of money just to use somebody else's innovations. They piled money and support into Obama's campaign, and soon enough Google's head of patents was promoted to head the US Patent and Trademark Office (causation v. correlation -- your call). The Supreme Court got involved an bought into the "patents are broken" line that the infringer lobby pushed -- and in response severely limited patents and patent rights. Congress got involved and created a system of post-grant review that has been called a "patent death squad". Fast forward to 2018. The U.S. Patent System dropped to 12th place in the U.S. Chamber of Commerce's global IP index, ranking below the new patent rights champion, Singapore, as well as France, Germany, Ireland, Japan, the Netherlands, South Korea, Spain, Switzerland, the UK, and Italy -- marking quite a fall for the previously top-ranked patent system. China is rapidly moving to reinvent its own patent system that improves on the Western patent system. The European Patent Office appears likely to survive Brexit, but the same forces that brought Brexit to electoral success -- and the US Administration's hostility to international trade agreements -- raise questions about whether the Patent Cooperation Treaty remains stable (for now, it is) and whether the EPO will continue to function (for now, it will). Finally, the IP markets have entirely seized up for small businesses and independent inventors. While big companies continue to wage billion-dollar court battles and reach 10 figure settlements, the introduction of the post-grant review ("PGR") regime and the inter-parties review ("IPR") category of PGR have raised the cost of asserting a patent by hundreds of thousands of dollars for each IPR filed (and some patents have seen double-digit numbers of IPR filings). Because of the uncertainty about what the US Supreme Court will do next and whether there will be a legislative fix for what the US Supreme Court did with the Alice and related decisions about patent eligibility, potential patent buyers are faced with a situation analogous to ... well, there really isn't a solid analogy. One that gets close is an owner of a house trying to sell it. Playing the role of IPR in this analogy is a prohibition on fire insurance and legalization of arson. Sure, you can buy the house, but if a big enough company decides it wants to destroy the house, it can. At will. It becomes an impossible task to sell a house -- or a patent -- under those circumstances. As a lawyer and a named inventor on over 200 issued patents, I have had plenty of opportunities to analyze the patent marketplace and consider how an independent inventor or small business should respond to these changes. Of course, the best strategy for me may not work for a particular invention or business, so you should seek legal advice tailored to your situation. (1) File a provisional patent application in the United States. This preserves the filing date but does not start the clock running on the 20 year patent term (which runs from the date the first non-provisional application is filed). (2) Before expiration of the provisional, file a Patent Cooperation Treaty application. This is a place-holder (just like a provisional) but it allows you to file years later in almost every country in the world. (3) Hope that the US patent system stabilizes before it is time to file a national phase application in the United States. (a) Germany (the EU's biggest economy). (b) China (the government is strongly backing growth in their patent system and -- if trends continue unchanged -- may well have a stronger patent system than the United States within a decade. (c) USA (the world's biggest economy). (d) Review the technology at issue and determine which other countries are good candidates. (5) With regard to the US filing, one strategy is to buy time for the US patent system to stabilize by filing an application that has claims that should be allowable and putting the patent application into the appeals process if it is denied. This will buy half a decade or more, much of which is ultimately tacked onto the patent term in the form of a patent term adjustment. (6) File for foreign patents via a non-US entity. This is a weird one, but there is increasing pressure on Canada and certain other former US trade allies to respond to the Trump Administration's trade policies by expropriating patents owned by US entities. 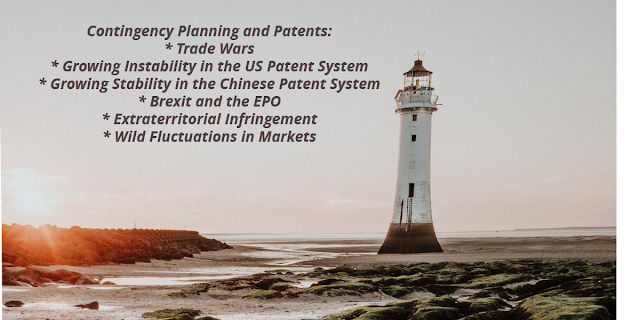 By having a non-US entity own your foreign patents, you have a better chance of avoiding seeing your patents fall victim to a trade war. While the US system was still the preeminent patent system in the world, and while China's IP policy was at best neglected, the strategy was much simpler: File for a utility patent in the United States and perhaps file abroad if you can make the business case for it. Now the strategy is complex, but with a simple organizing principle: IP law is in flux, and filing strategy needs to preserve the maximum amount of flexibility to respond to changes. One example of the flux we're waiting out? The United States is about to find out whether a patent is void (as a result of the on-sale bar) if the inventor shows the patent to a third party under a non-disclosure agreement. Last year's flux? Determining whether extraterritorial sales of patented items exhaust US patent rights. Before that? The legality of the IPR system. Before that? Subject matter eligibility. The United States has made changes to the patent system such that baseline, critical questions remain unanswered -- and the answers are coming out at a snail's pace.